For some, Valentine’s Day is the best holiday ever, for others its a true nightmare in all shades of pink. Art director: Hm, so what’s the joke here? Designer: Well, it’s about sacrifices in the name of love. Art director: I still don’t get it. Let’s try something else. OK, vanilla ice cream and pink drool. Art director: That’s if we want to be cynical about the holiday. What if we don’t? Yeah, that’s going to be more difficult. How can we be a wee bit cynical, yet still make it about love? Pigeons shitting on a monument? 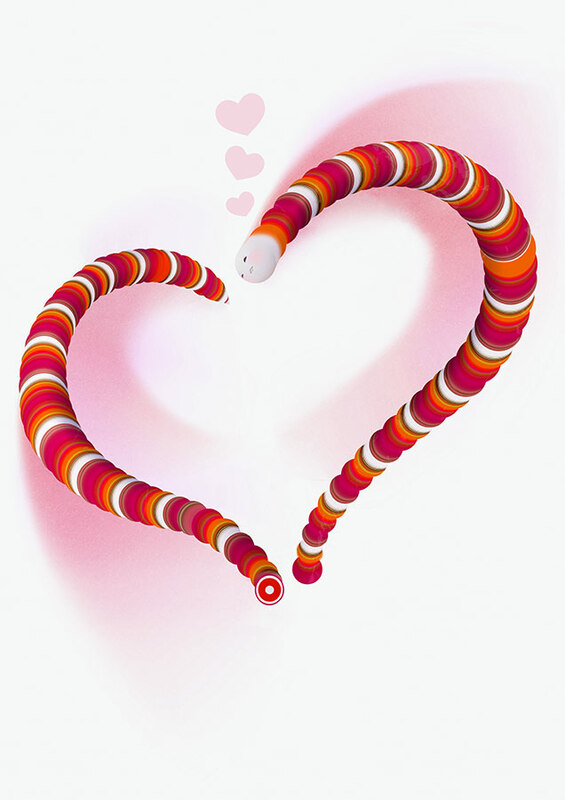 Or a story about how two halves of a rainworm fell in love with each other? Art director: Yep, you’ve got something there. They just beg to be arranged in a heart shape. Sending the sketch to the trusty illustrator to make it equally cute and repulsive. The art director asks to make the cut larger and says that the worm should have only one white head. Making the final corrections and sending to the typesetter.